GE Healthcare is showcasing a host of new applications and smart devices built on Edison – a platform that helps accelerate the development and adoption of Artificial Intelligence (AI) technology and empowers providers to deliver faster, more precise care. 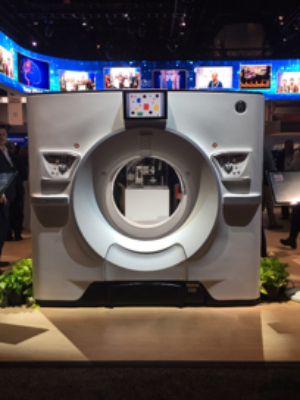 Expanding on GE Healthcare’s 200+ Imaging applications, Edison includes new technologies to improve scan consistency, help clinicians detect and prioritize acute cases and extend the lifecycle of devices. Edison is a holistic and integrated digital platform, combining globally diverse data sets from across modalities, vendors, healthcare networks and life sciences settings. “Edison is an intelligence platform that brings together data from many different sources, both inside and outside the hospital infrastructure, from multiple modalities, from multiple vendors, from multiple hospital networks – even clinical group trials and genomics. Edison brings all that data in and packages it in a way that helps clinicians guide diagnosis, speed up treatment, deliver better outcomes and increase patient satisfaction,” said David Seda, Chief Marketing Office, Vice President, Healthcare Digital. GE Healthcare is featuring Edison applications and Edison-powered devices, including Critical Care Suite*, pending 510(k) approval, on the Optima XR240amx mobile X-ray system, designed to identify cases of pneumothorax at the point of care to enable prioritization of image review. The Critical Care Suite will employ a suite of AI algorithms hosted on the mobile X-Ray system to share the output through an onscreen notification. When a pneumothorax condition is identified, the point-of-care notification alerts the clinical team, enabling prioritization of image review. The AI results are sent to PACS for review of the critical findings by a radiologist. “It can take between two to eight hours before an X-ray gets to a radiologist who can interpret it. If you have a collapsed lung, you need attention before that,” said Seda. “Critical Care Suite on the Optima XR240amx analyzes the scan as it's taken by the technician. If it detects a critical situation, it notifies the technician at point-of-care to enable prioritization of the image review by a radiologist, the moment it's scanned. This cuts down that two- to eight-hour wait,” said Seda. The Revolution™ Apex is built on the Edison intelligence platform and has a new imaging chain and X-ray tube to improve image reconstruction with what GE calls TrueFidelity images. The company also announced Automated Lesion Segmentation on LOGIQ™ E10 ultrasound system, which helps eliminate measuring lesions manually by segmenting an identified breast, thyroid or liver lesion and automatically providing a trace of the lesion and corresponding area. In addition, CT Smart Subscription provides continuous access to the latest CT software, extending the lifecycle of the device and making it more valuable over time. Applications can be selected based on a hospital or health system’s unique needs, with options ranging from intracranial hemorrhage and stroke detection to routine dose reduction and optimization to cardiac function assessment. 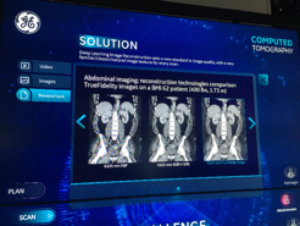 GE Healthcare Unveils Intelligence Platform. Appl Radiol.